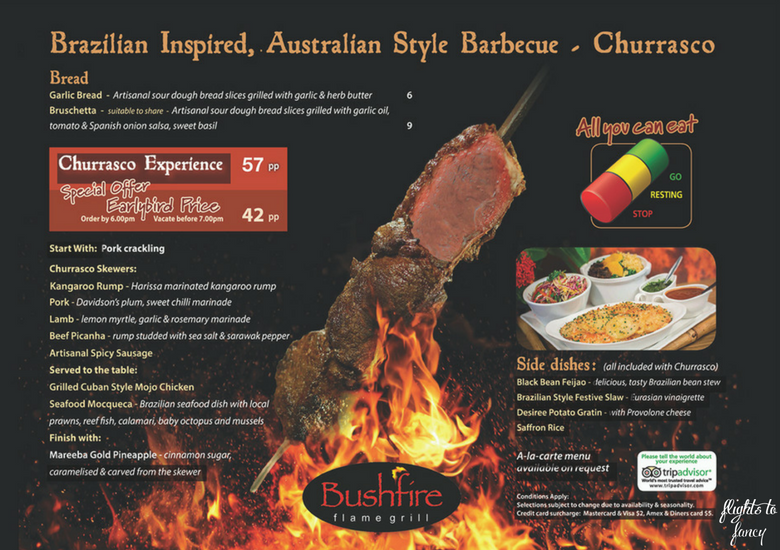 Bushfire Flame Grill Cairns is an award-winning, Brazilian inspired, Australian style BBQ restaurant located in the lobby of the Pacific Hotel Cairns. Big eaters visiting Tropical North Queensland will rejoice in the all you can eat concept, which is unique among restaurants in Cairns. 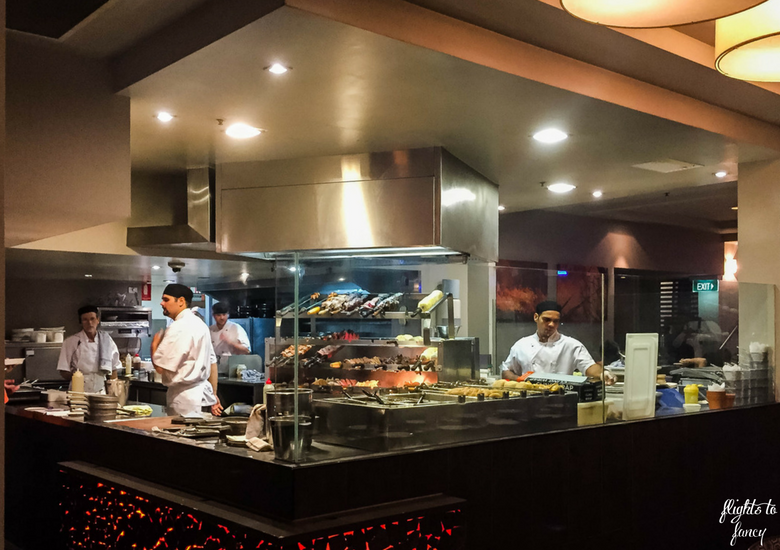 Huge metre long skewers of succulent Australian kangaroo, beef, pork and lamb are served rodizo style at your table by knife wielding waiters. 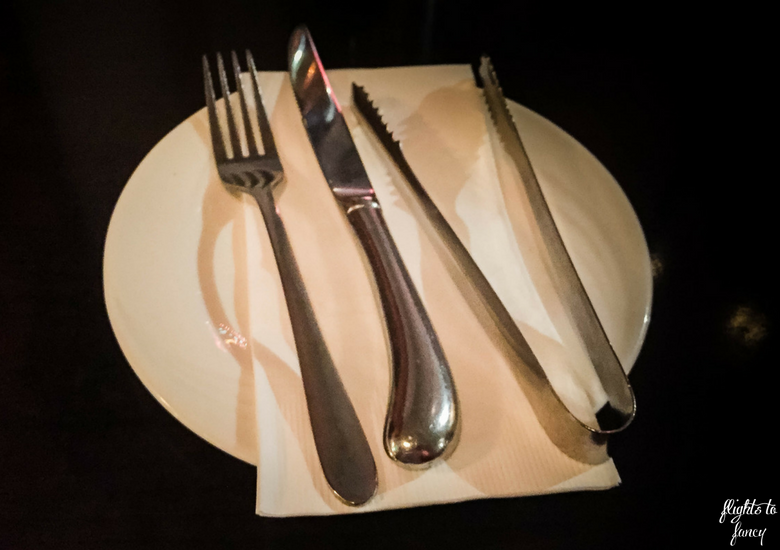 Table settings at Bushfire come with two unique tools; the tongs enable diners to hold the meat as it is sliced and the coloured block that let’s you signal your server that you want more food (green), are having a rest (yellow) or are done for the night (red). I love this concept as it means you get attention you need when you want it and are not disturbed when you don’t. Genius! As well as the skewers, a number of other dishes are served directly to your table. If all you can eat Australian Style BBQ doesn’t float your boat, you are sure to find something to entice on Bushfire’s à la carte menu. Bushfire Flame Grill Cairns is mere steps away from The Abbott Boutique Hotel where we stayed during our 5 day Cairns road trip so we left our bargain hire car behind and walked the short distance. Given we didn’t need to worry about the booze bus, we were free to indulge from Bushfire’s well stocked bar. The Hubs couldn’t resist the house brew while I stuck to my standard Sauv Blanc. I loved that you could see all the action in the kitchen from the large dining area. 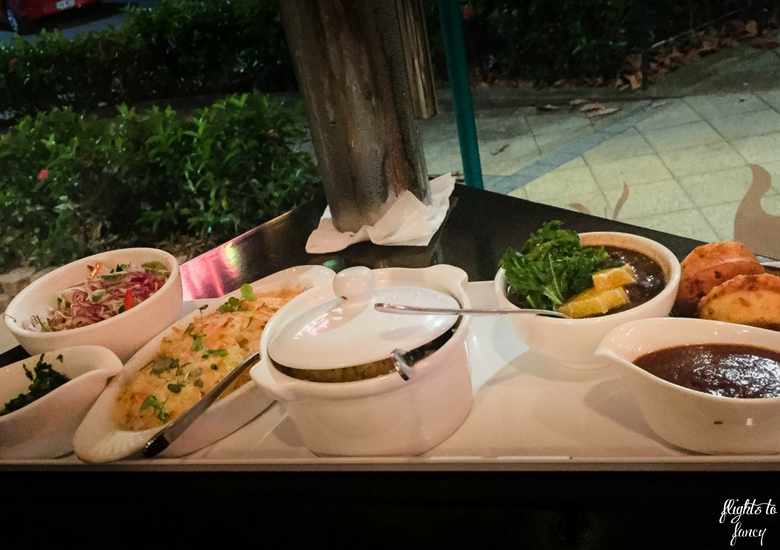 Not long after we were seated at a window table, our server presented a delicious platter of sides that comes with every Brazilian inspired BBQ ordered. It took a lot of willpower to leave them alone until our first skewer arrived. Who am I kidding? We tucked into the warm bread straight away and the potato gratin was divine. As quick as we could turn our block to green, a waiter arrived with a delicious looking skewer. Over the course of the evening we sampled them all. My favourite was the spicy sausages, while The Hubs preferred the perfectly cooked beef. If you have a preference for the way you like your meat cooked, just let your server know and they will slice from the section that suits your preference. 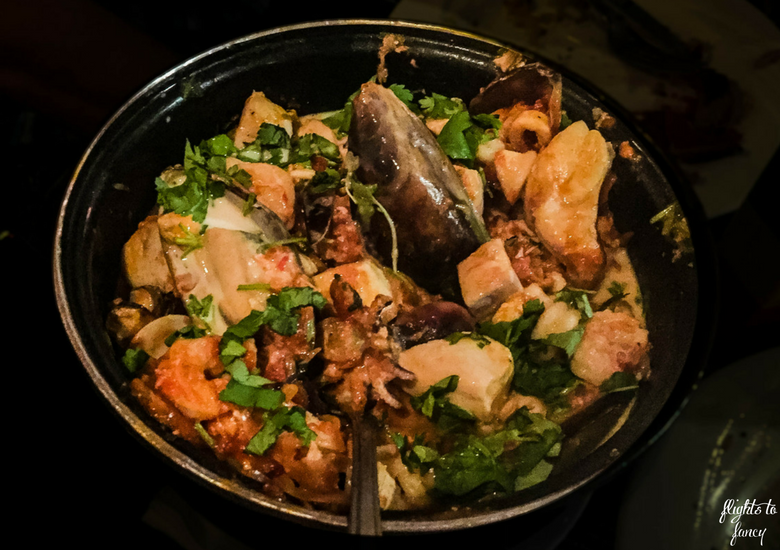 Seafood lovers will delight in the mocqueca hot pot which features prawns, reef fish, calamari, octopus and mussels. Just when we thought we could eat no more, our server brought over a sampler calamari skewer. This is not currently on the menu and Bushfire are testing the recipe to make sure it is absolutely perfect. I loved it and hope to see it featured soon. The caramalised pineapple to finish with satisfy any sweet tooths out there. 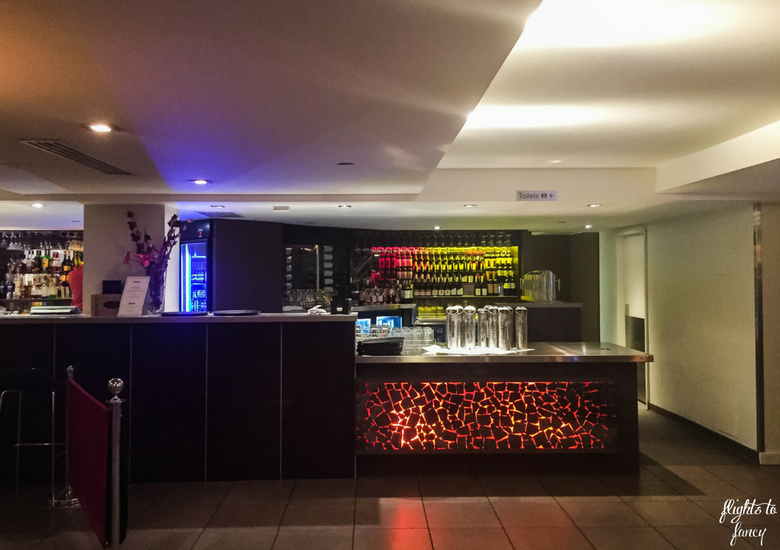 Getting to Cairns is easy from most Australian cities with Jetstar Domestic and there is a wide variety of things to do in Cairns for visitors from all walks of life. If you are on a budget check out all my tips for securing a bargain flight before you book. 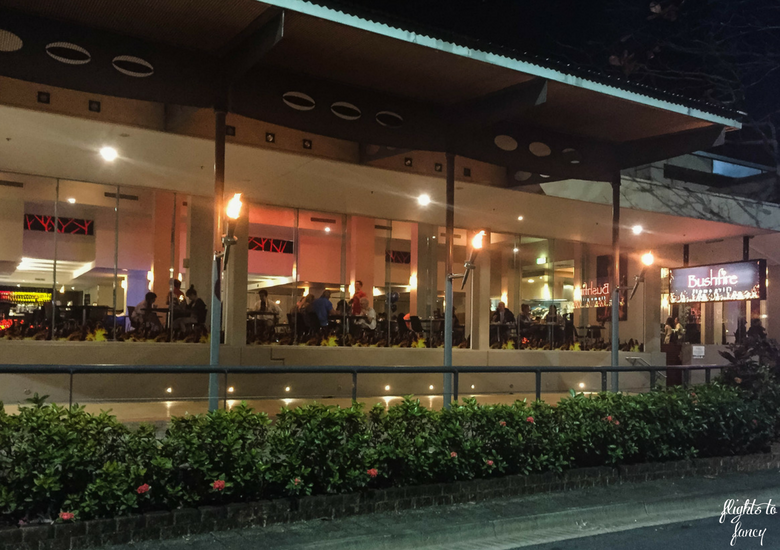 Bushfire Flame Grill is one of the most popular restaurants in Cairns so be sure to make a booking before you head to Tropical North Queensland. 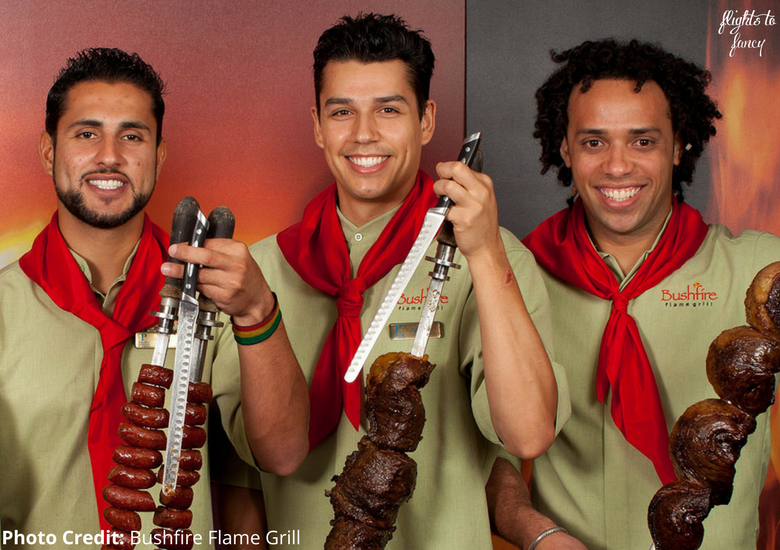 Will you choose the Brazilian inspired Australian style BBQ or one of the á la carte favourites? I’d love to hear your thoughts in the comments below. Disclaimer: We dined as guests of Bushfire Flame Grill Cairns. As always, all opinions are my own. This post contains some affiliate links which will earn me a few cents to contribute to the running of this site if you make a qualifying purchase at no extra cost to you. Yum, this place looks amazing! I love a good Brazilian churrasco, and the Australian mix is a real plus. I was drooling as I read about all the options for the bbq! This is one place I have to visit if ever in Cairns! Hope you make it to Cairns soon Lisa! Oh Wow ! This looks amazing!!! I’m heading over to Australia in a couple of months so I will definitely check this place out! I am totally sold at The Bushfire Flame Grill. This restaurant sounds like an amazing one in Cairns and I’d love to try that caramalised pineapple! Would love to dine here. The pineapple was a highlight Harsh! Me too! 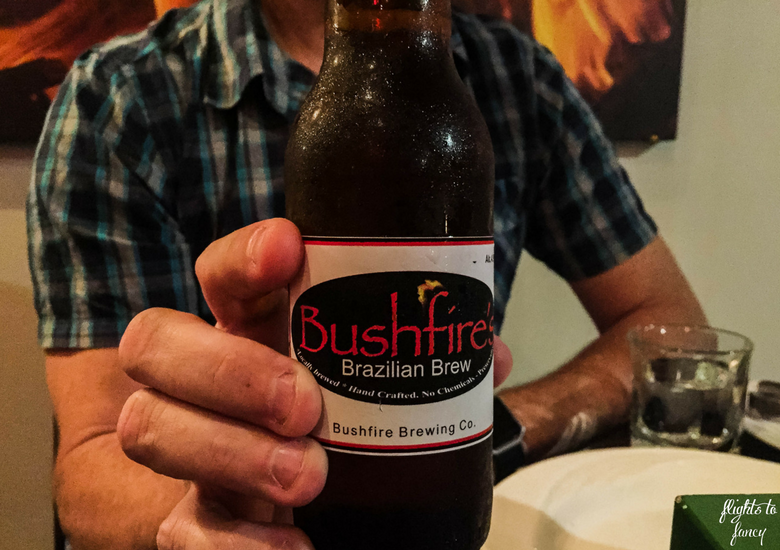 Bushfire has a great Aussie twist! Nope have never tried churrasco ( and I eat a lot lot lot of foreign foods) but anything barbecued & on a skewer is good for me! The Bushfire Flame Grill looks like a good restaurant to visit in Cairns. 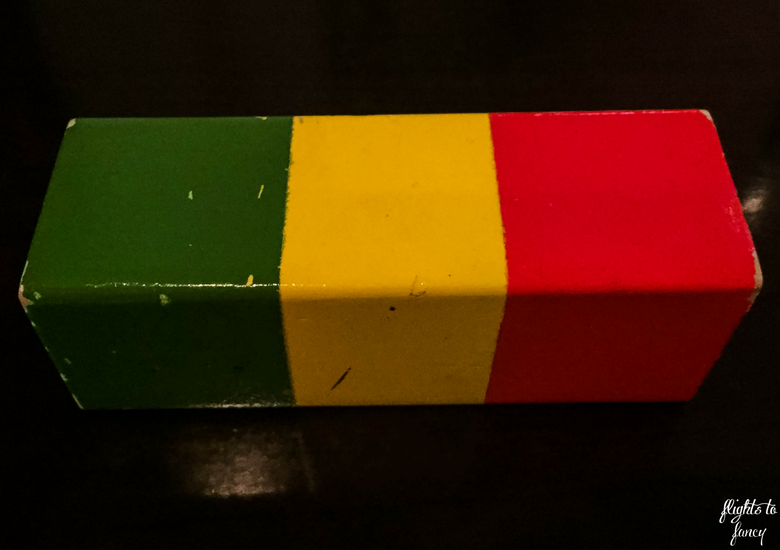 I love the idea of the green, amber and red block to tell the waiters what’s going on. I think I’d have a hard session in the gym before visiting to get all the benefits of the protein! I know how cool is that! I have to admit I have not been to a Brazilian style restaurant. I am ashamed. We keep making plans to go but it has not happened yet. Bushfire seems like a great experience. A very simple concept with the blocks that I feel every restaurant should implement. The food selection is great and I too would dive in to the sides knowing full well I will possibly get full by the time the main course arrives. Do it now! You won’t regret it! I’m the worst person possible to bring to one of these places because I don’t like red meat. But all of the side dishes look delicious. Do they have any chicken or seafood there? They sure do Ania! They have a full a la carte menu available ? Your post makes me hungry now and these grilled delicacies of BushFire Flame are so tempting and delicious. I loved the ambiance of this place with live cooking. 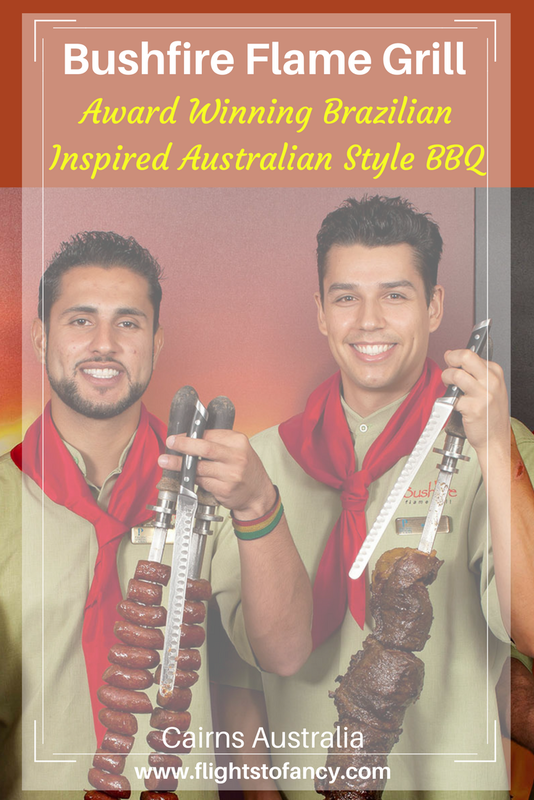 I have never tried Brazilian inspired BBQ before and would love to have this yummy experience. Give it a go Yukti! I’m sure you will love it! I just had lunch and now, just by looking at your photos and reading about the amazing treat you’ve got at Bushfire, I’m hungry again! The amount of food you are getting for such a low price is insane! I would love to try the mocqueca hot pot but also the kangaroo steak (never had it before). The beef your husband has looks amazing, perfectly cooked! Bushfire is really great value for big eaters Joanna! 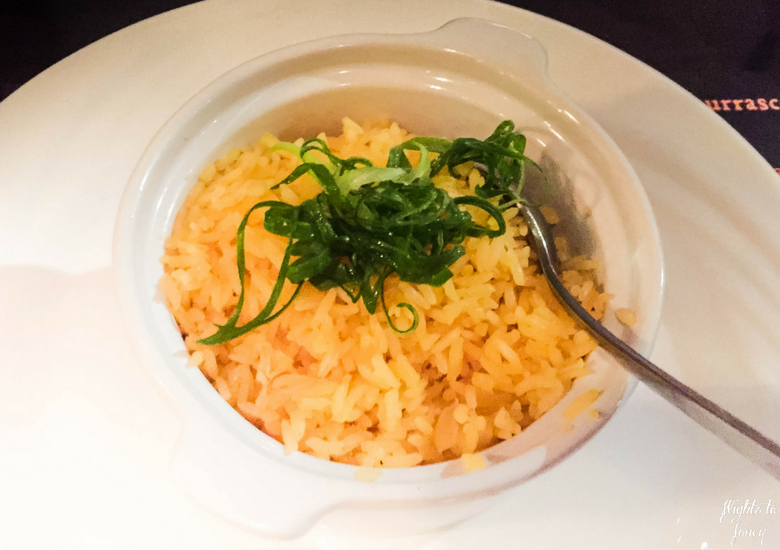 If not the a la carte menu is also a great choice! hmm. Yum! I am a serious carnivore and this looks delicious! 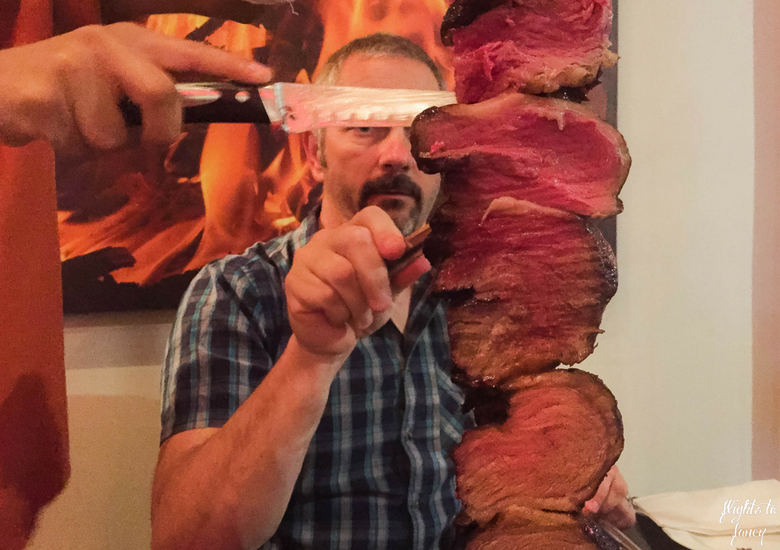 I went to a Brazilian BBQ in Seoul, Korea, but i can imagine the meat cuts in Oz must be far better. great restaurant and looks really relaxed, Come hungry is all i can see! Australian beef is among the best in the world Bee! I bet they didn’t have Kangaroo at the Korean BBQ ? I used to be a well done kinda girl Lisa but these day I opt for medium. Aussie beef is the best in the world! Sounds like a lovely date night, and that salad looks gorgeous! I always love rainbow food- and anything cooked in flames! I’m vegan but the side dishes at Brasilian restaurants always look the bomb and I love the vibe of the places. The sides were amazing Hannah. Wow this is so cool!! I had no idea about this place! Will totally have to try it on my Cairns trip! Love that you can see the food being cooked in the kitchen and love the all you can eat concept! Great pics + great experience! Awesome! Hope you enjoy it as much as we did ? The food looks so delicious and specially the grilled meat. As I love meat fully cooked, this seems like a delight to me. Completely loved thr idea of colour blocks to tell your preferences to the server. The ambience of the restaurant lookss so pleasing that I would surely like to dine in there. Thanks for sharing. I tend to like my beef medium Shibani but the skewers are all cooked to different degrees so your server can slice to your selection. I got hungry reading this post. This looks so delicious. Would love to visit this someday. Hope you make it to Bushfire soon Indranil! They are popping up all over the world Kristina! Never say never to Kangaroo! Ugh, my whole mouth is salivating! My boss takes us to a local Brazilian place for special occasions and the food is just amazing. I can only imagine trying this out with it’s Australian flair! Anything cooked over an open flame is just delicious. I’d totally try every type of protein, because hey! You never know what you’re going to fall in love with, right? Agree Rachelle! Everything tastes better over an open flame! 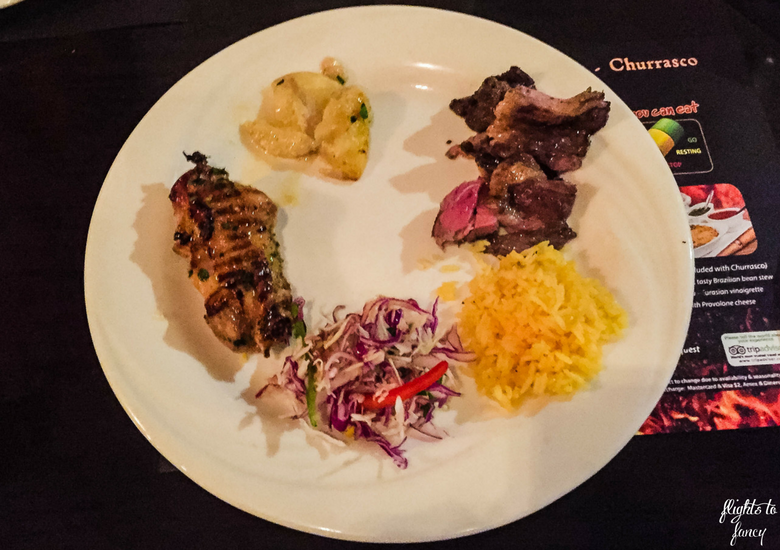 I love a good BBQ feast and have only tried Churrasco BBQ once. This post reminds me to try it again because it was so good! I would love to dine here when in Cairns! Glad you enjoyed it Abigail! Hope you make it back soon. Not to mention all you can eat Linda! Considering it is all you can eat it’s great value Gina. We left very full! They have a mushroom risotto on the a la carte menu that would be perfect for you then Neha. ? There are lots of meats to choose from. I really liked the sausages. Ive never tried Brazilian Churrasco but it seems delicious ! I am not so sure about eating Australian kangaroo tho! My friend moved to Australia recently and she was telling me about eating this cute animal! I would still try Bushfire Flame Grill Cairns for some beef 🙂 Food looks amazing there! 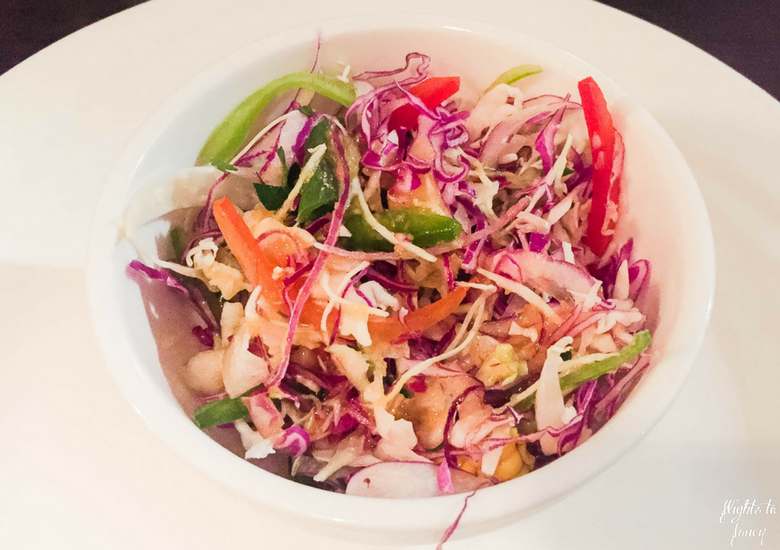 It’s an acquired taste but I urge you to give it a try if you make it to Bushfire Grill!